Cassiope or Cassiopeia, Andromeda's mother, was the beautiful Ethiopian queen of the Phoenician town of Joppa. She was so proud of her daughter's and of her own appearance that she challenged Poseidon's ire, by claiming that they were more beautiful than the sea nymphs. For pity's sake, we do not want to follow her example and defy the gods, but it is obvious how the Cassiopeia we are describing here - not only a one-off but also the first mega-yacht of the Dutch yard Holland Jachtbouw - has a special appeal capable of evoking unquestionable elegance resulting from timeless classic lines. The builder is Dutch but the designer who signed the drawings of this aluminum 105' is American - the Langan Design Associates of Newport, Rhode Island. The Dutch and the American spirits are fully tangible: once on board, the guest is welcomed by painstakingly modeled classic interiors, where teak is dominant - a representative feature of Dutch workmanship - and all spaces are fully usable, a real "must" in American yachting. We go onboard from astern. 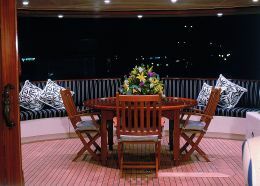 The cockpit, shaded by the upper deck, includes a C-shaped sofa that is wider than the transom; the flooring, as for the rest of the deck, is in teak. In the center there is a round table with chairs. The aft platform is not very wide for easy launching of the two jet-skis stored in the two side garages. Inside, we find the full-beam ample saloon, with, to port, a comfortable living room and opposite two armchairs with a cabinet containing a large plasma screen that may be concealed when not in use by means of a pop- out mechanism. 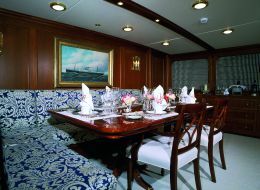 This area is separated from the dining room, which is forward but on the same level, by means of a half upper deck where there is the helm station. The helm station is classically fitted amidships and, thanks to the half-deck solution, it guarantees excellent visibility both under way as well as when maneuvering. Astern of the cockpit there is not only direct access to the flying bridge but also a settee for guests relaxation. The L-shaped dining room with table that seats eight is to starboard. The fully equipped galley and crew dinette are forward. 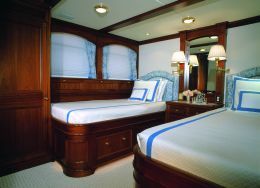 This area is connected with the underlying crew quarters that include two double cabins - one with double bed and the other one with two bunks - and one bathroom. 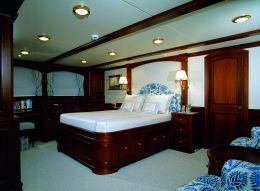 Amidships of the lower deck there is the full-beam master stateroom, at the center of which there is the double bed. To port there is a long cabinet offering much storing space and a combined desk and vanity. 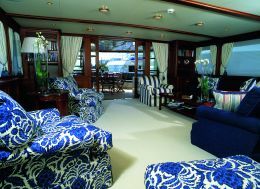 To starboard there is a small living area with two armchairs and coffee table. Between this cabin and the crew quarters there is a full-beam area partly occupied by the en suite bathroom and partly by the dressing room. 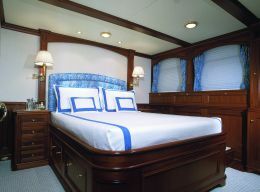 Proceeding aft, there are the two guest cabins - one with twin beds and the other one with central double bed - having same size and en suite bathroom. 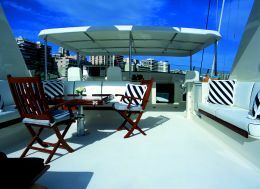 The flying bridge is accessible from the helm station as well as from the cockpit and seems to be divided into two different areas. The dashboard is forward and to port and is protected from sun and rain by a Bimini top. 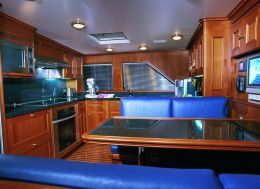 Aft of the pilot and co-pilot seats there is the outside dinette with an L-shaped settee and opposite there is a cabinet with barbecue, sink, refrigerator and pantry. Aft of the flying bridge there is a fully equipped sunning area for suntan lovers, the remaining space is occupied by the tender that may be launched and hoisted by means of a davit. From the technical point of view, the hull and superstructures are in aluminum. The semi-displacement hull and the light superstructures combined with the two 1,800 hp MTU engines are capable of offering a maximum speed of 27 knots. 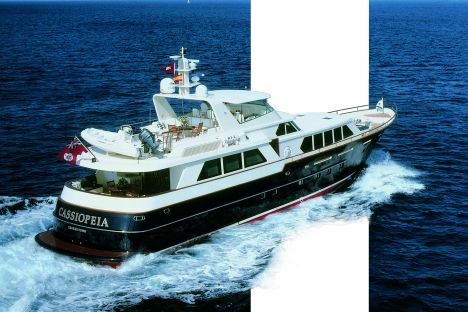 The range of this motor yacht at the cruising speed of 17 knots is approximately 750 miles.